If it weren’t for comfort foods, I probably would never have to exercise again! Okay, not really. But why is it that the foods Americans so often refer to as “comfort foods” always include pasta, bread, cheese and/or gravy!??! Not the healthiest choices by far, but I am definitely an “everything in moderation” kind of girl! This recipe is one of my very favorites. 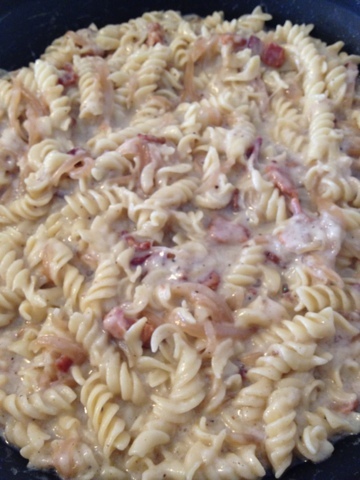 I mean, how can something with cheese, caramelized onions, bacon and wine be wrong?? This recipe uses one of my favorite cheeses, Gruyere. Gruyere is a hard, yellow cheese. It is sweet but slightly salty, with a flavor that varies widely with age. It is often described as creamy and nutty when young, becoming more earthy as it ages. 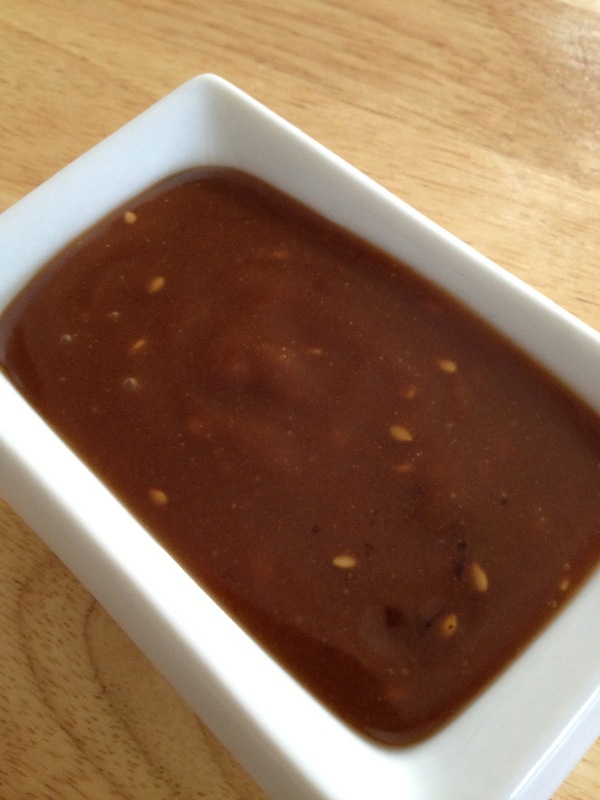 It is a great melting cheese and is often used in fondues, quiches, and on French onion soup. It also calls for an ingredient that surprises some people, nutmeg. I use nutmeg in many savory dishes including my chili for an added depth to the flavor that will have people asking what they are tasting. 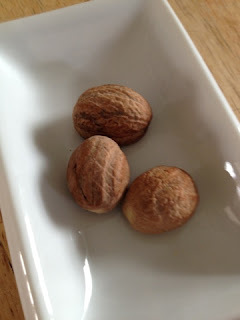 Nutmeg is the hard, brown seed from the nutmeg tree which is a tropical evergreen tree. Most cooks prefer to grate it fresh from the seed. The seed should be stored in an airtight container, away from heat, moisture and sunlight. Though there is some disagreement about storing dry spices in the freezer because they may lose potency, I do store my nutmeg seeds and my ginger root in the freezer. I pull them out and grate them fresh whenever I need them. I store them for many months, and have not noticed either losing any flavor or aroma. Cook pasta as directed on package to al dente. Don’t overcook because the pasta will continue to cook in the sauce. While the pasta cooks, heat olive oil in a pan. Crisp the bacon in the olive oil. Remove the bacon, reserving the oil and bacon grease in the pan. 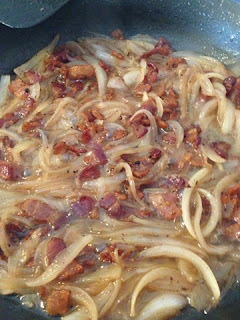 Add the onions and cook over medium heat until softened and just beginning to caramelize. Add the wine and reduce 1-2 minutes. At this point, your kitchen will smell amazing!! Add the onions and cook over medium heat until softened and just beginning to caramelize. Add the wine and reduce 1-2 minutes. As the onions cook, in a saucepan, melt the butter and whisk in the flour to make a roux. After a minute or two, whisk in the broth and milk. Allow to thicken several minutes then add salt, pepper and nutmeg to taste. Add a few drops of the hot sauce. Whisk in the mustard. 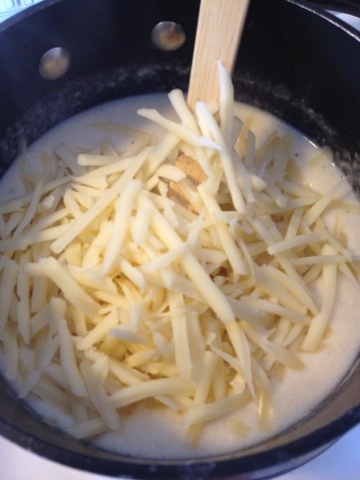 Remove from heat and stir in the shredded cheese, a little at a time to melt into the sauce. 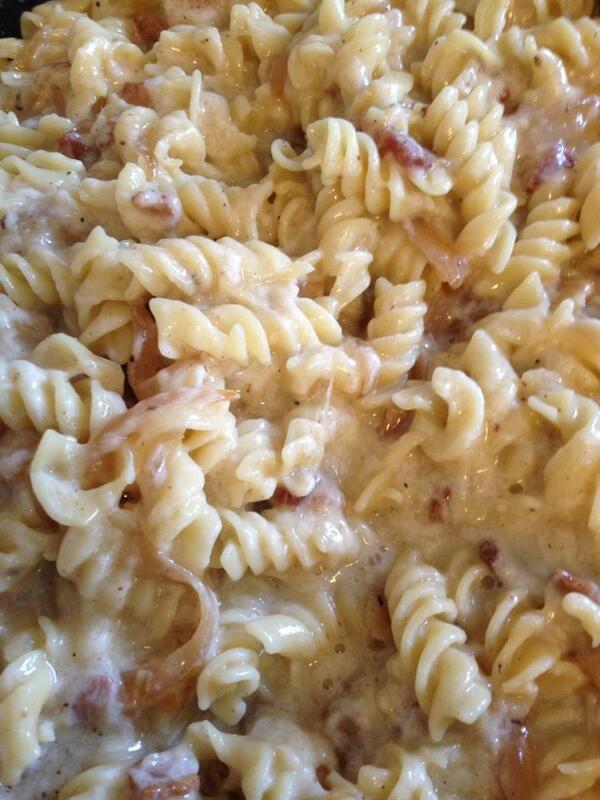 Pour the cheese sauce into the pasta and toss together. Serve with a leafy green salad and crusty bread…and a glass of the wine you opened, of course! Cook pasta as directed on package to al dente. While the pasta cooks, heat olive oil in a pan. 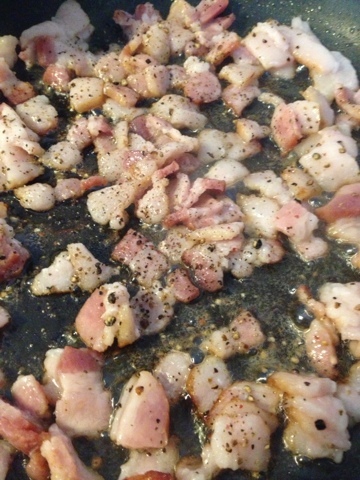 Crisp the bacon in the olive oil. Remove the bacon, reserving the oil and bacon grease in the pan. 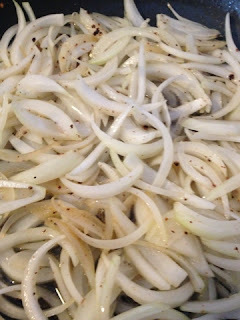 Add the onions and cook over medium heat until softened and just beginning to caramelize. Add the wine and reduce 1-2 minutes. As the onions cook, in a saucepan, melt the butter and whisk in the flour to make a roux. After a minute or two, whisk in the broth and milk. 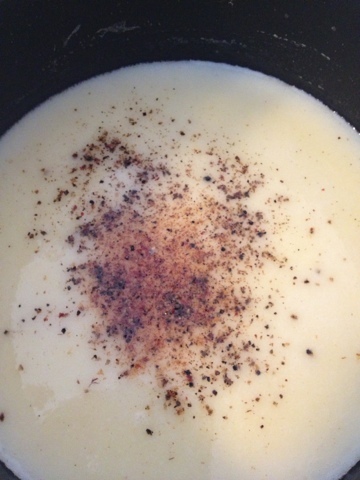 Allow to thicken several minutes then add salt, pepper and nutmeg to taste. Add a few drops of the hot sauce. Pour the cheese sauce into the pasta and toss together. Welcome [Back] to My Kitchen! I just want to say a ginormous Thank You! to everyone who takes the time to peruse my blog. Whether you land here on accident or by choice, I hope you find something of interest and are inspired to try something new by adding herbs and spices to your cooking. I am excited that I have reached over 2,500 page views from people in 13+ countries. I am grateful for Facebook, Pinterest, Blog Spot and other search engines for getting my posts out to so many people. And, I am thankful to everyone who “pins” my recipes or shares them with others. 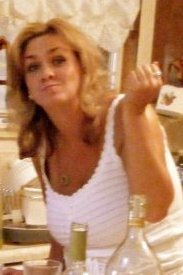 Changing Seasonings was recently accepted to a food blog registry, Foodblogs.com, so welcome to any new readers! I have tried to make reading the posts as easy as possible for everyone by including the translator and food term dictionary widgets. Don’t miss a single post by signing up to receive the next posts via your email or add Changing Seasonings as a favorite on Blog Spot or Foodblogs.com! Lastly, please comment, comment, comment!! I want to know what works, what doesn’t, what ideas my recipes inspire for you, what questions you have. There is a comment space at the bottom of each blog, and I have the settings so that you don’t have to be a registered Google or Blog Spot follower to comment…anyone can make comments! Thanks again! I’m looking forward to reading your comments!! I live in a rural part of northeast Indiana. The nearest Thai restaurant is about 45 minutes away, so when I had a Thai craving it went unsatisfied…until recently. After much searching and adapting, I have put together a Thai inspired feast that is spicy and simple. I tied together the flavors of the dishes with the crushed red chili pepper and lime. The meal includes Chili Lime Roasted Cauliflower, Chili Lime Grilled Chicken Satay Skewers and Roasted Tofu with a Thai Peanut dipping sauce on Coconut Milk Rice, and Pad Thai noodles. 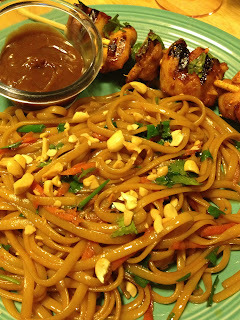 I love the spiciness of Thai, and all of these recipes are plenty spicy. I do not recommend adjusting the heat at all until you’ve sampled first. First, the base of the Pad Thai, Peanut Sauce and the marinade for the Chicken and Tofu is a spicy sesame oil made by combining 1 C of Sesame Oil and 2 T crushed red chili peppers in a small saucepan and heat over medium heat for 2-3 minutes. Pour through a strainer to remove pepper flakes. Reserve oil for use in the following recipes. And, in case you skipped the last line of the previous paragraph, do not add extra pepper…this will be plenty hot! Whisk together. 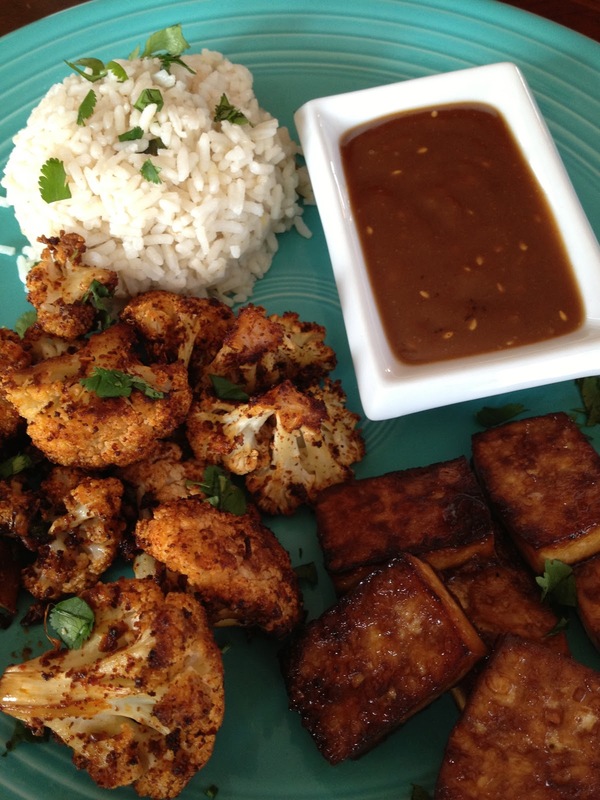 Set aside as dipping sauce for chicken, tofu and cauliflower. Preheat oven to 325 degrees. Clean the cauliflower and cut apart florets. Mix together the remaining ingredients, reserving half of the cilantro for garnish. 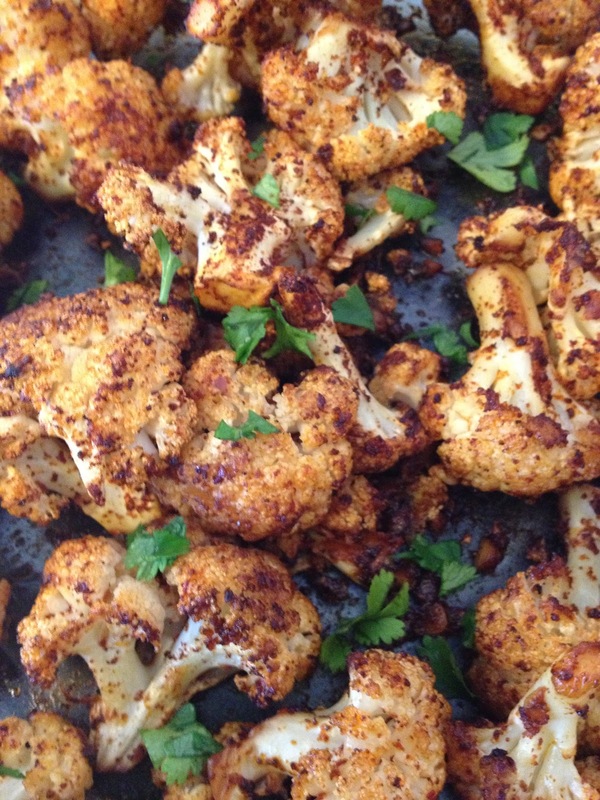 Toss with cauliflower in a large bowl. Place on a baking sheet. Roast 1- 1 1/2 hours, turning occasionally. Garnish with a squeeze of lime juice and the remaining cilantro. Mix the ingredients. Place the tofu in a dish and cover with marinade. Refrigerate for 30 minutes. Preheat oven to 400 degrees. 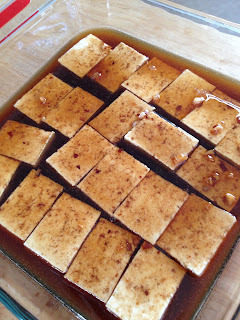 Place tofu on a baking sheet and roast for 20 minutes. Turn halfway through cooking time. 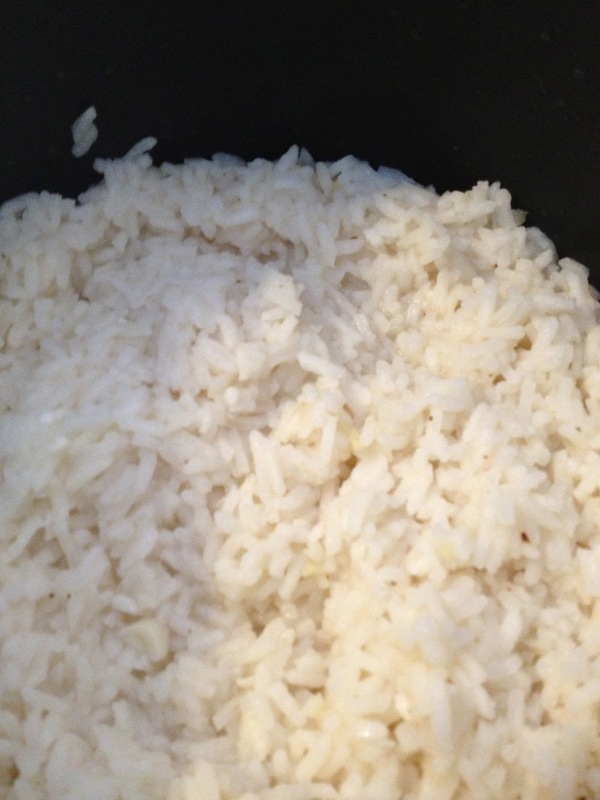 Prepare rice as directed on package, but substitute equal amounts of broth and coconut milk for the water. 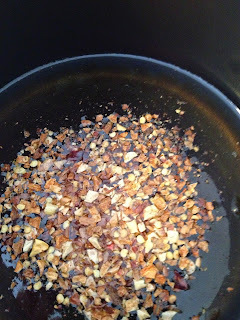 Add ginger and clove. Once fluffy, toss in the chopped cilantro. Mix the ingredients, reserving 1T of cilantro for garnish. Cut the chicken into pieces to skewer. Place the chicken in the marinade and refrigerate for an hour. Skewer the chicken pieces. Grill for 6-8 minutes per side. Garnish with lime juice, lime slices and chopped cilantro. Mix together the first five ingredients. Set aside. Prepare noodles as directed on package. Heat olive oil over medium-high heat. Sauté the white part of the onion, carrots and garlic. Scramble in egg if desired. Reduce heat. Toss in noodles and add sauce. Garnish with chopped peanuts, green onions and cilantro. This is a lot of food! I actually made the Pad Thai and Chicken Satay skewers with Peanut Sauce for one meal, and then had the cauliflower, tofu and rice for another meal…my meatless meal for the week. Once you have the Sesame Oil and Siracha in your pantry, these actually end up being very economical too. Considerably less than ordering take-out, if you live closer than I do to a Thai restaurant!